Mame Diouf’s spectacular individual effort earned Stoke three points at the Ethiad. Mark Hughes got a huge win against his former club. STOKE CITY CONDEMNED defending champions Manchester City to their first defeat of the Premier League season with a shock 1-0 win at the Etihad Stadium on Saturday. Senegalese striker Mame Biram Diouf scored a memorable solo goal in the 58th minute to give Stoke manager Mark Hughes victory over his former club. It was only the second time City had failed to score at home in 71 league matches and only their second home defeat since May 2013. City handed a first start of the season to striker Sergio Aguero, while French right-back Bacary Sagna made his debut following his switch from Arsenal, and the hosts enjoyed the best of the first half. Stoke goalkeeper Asmir Begovic had to push away a powerful drive from Samir Nasri and Yaya Toure hit the crossbar, although Manuel Pellegrini’s side also lost Fernando to injury, with Fernandinho coming on in his place. 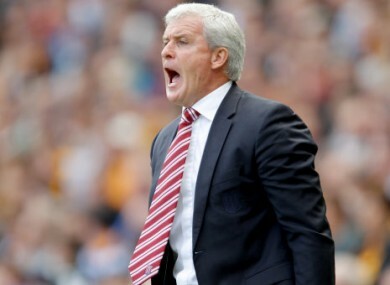 Stoke refused to buckle, however, and shortly before the hour they took the lead. Former Manchester United striker Diouf picked the ball up in his own half, beat Aleksandar Kolarov and outmuscled Vincent Kompany before squeezing a shot between the legs of City goalkeeper Joe Hart. Pellegrini sent on Jesus Navas and Edin Dzeko for Nasri and Stevan Jovetic, but with Toure denied a late penalty after a wild challenge by Erik Pieters, the visitors held on. Email “Stoke's solo screamer sinks City ”. Feedback on “Stoke's solo screamer sinks City ”.